On Wings of Eagles: Are you willing to die for your faith? From "Living Above the Level of Mediocrity," by Chuck Swindoll. "On Sunday, believers arrived at a house church in the Soviet Union in small groups throughout the day so not to arouse the suspicion of KGB informers. They began by singing a hymn quietly. Suddenly, in walked two soldiers with loaded weapons at the ready. One shouted, "If you wish to renounce your commitment to Jesus Christ, leave now!" Two or three quickly left, then another. After a few more seconds, two more. "This is your last chance. Either turn against your faith in Christ," he ordered, "or stay and suffer the consequences." Two more slipped out into the night. No one else moved. Parents with children trembling beside them looked down reassuringly, fully expecting to be gunned down or imprisoned. The other soldier closed the door, looked back at those who stood against the wall and said, "Keep your hands up--but this time in praise to our Lord Jesus Christ. We, too, are Christians. We were sent to another house church several weeks ago to arrest a group of believers." The other soldier interrupted, "But, instead, we were converted! We have learned by experience, however, that unless people are willing to die for their faith, they cannot be fully trusted." Today let us start deepening our relationship with the Lord so that our minds may be focused on heavenly things and not consumed with the weight of all the worldly ones. That it would be easy for us to make a stand for Him should that day ever come. Dear Lord, help us deepen our faith and trust in You today. 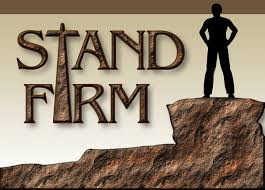 Help our faith in You be so real that we would not run when confronted to denounce our faith or face the consequences. In the Name of Jesus Amen.